Energy Code Basics: FAQ – State Wide Code Apply Locally? 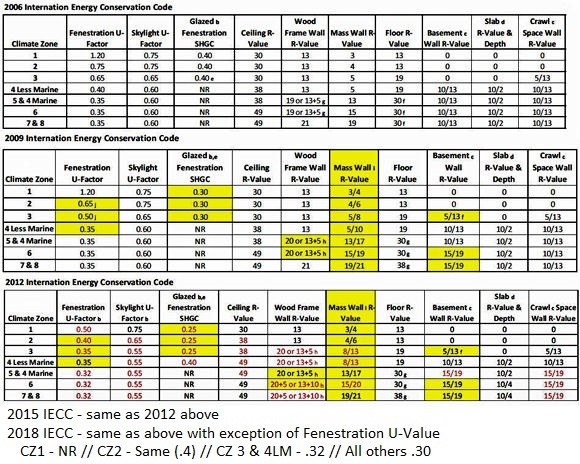 You are here: Home / Building Codes / Energy Code Basics: FAQ – State Wide Code Apply Locally? Does a “state wide” code still apply if the local Building Department / AHJ has not adopted it? What happens if they “adopt” or “list” it but flat out state that they don’t enforce it or maybe just certain parts of it? How does this impact you; are you free to skip some items, use less insulation, not do the required testing, or…. I mean shoot, if the Building Department says all is good, all is good right? Did my state adopt a statewide energy code? 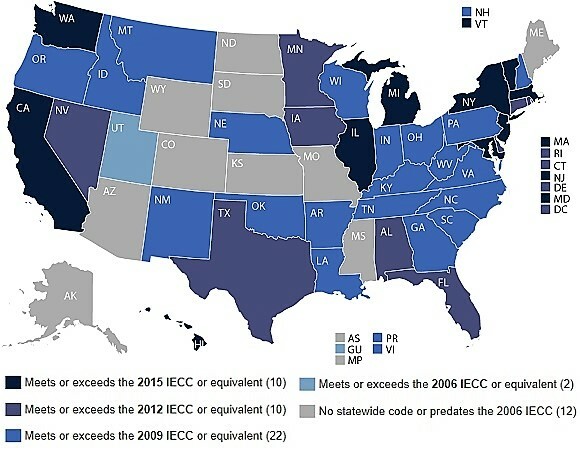 Above is a graphic from our friends at BCAP that shows the status of energy codes adopted by each state as of March 2017. As you can see 38 out of 50 states have adopted a “state wide” code. Unfortunately it appears that BCAP has gone dark so things may have changed for your state (for example Illinois will soon be on the 2018 version.) However if you follow the BCAP link above, you can select your state & browse to the appropriate contact to see where your state stands currently. Does an AHJ have to adopt the code? Ironically it is easier for a legislature to block portions of a code (42 States block Fire Sprinklers rather than adopt one. With that said even then they had to grandfather in existing ones that had adopted said provisions earlier. In other cases, some also added in “population” based exceptions like Maine’s that only applies to jurisdictions with over 4,000 people unless they choose to adopt them. In case you are curious that means 92 jurisdictions are exempted or 23.6% of the population. Sweet, so my AHJ doesn’t enforce it, am I off the hook? Not by a long shot… Finishing off the language above is “If a unit of local government does not regulate energy efficient building standards, any construction, renovation or addition to buildings or structures is still subject to the provisions contained in the Act.” So in simple terms, in most states where the AHJ doesn’t enforce it, a builder / remodeler / trades contractor / homeowner is still subject to all aspects of the energy code. With that if there is a specific exception (like Maine above) then yes you are theoretically off the hook. I know a few are going, yeah but who is going to hold our feet to the fire… Well, there are a few groups starting with local associations you may belong to, lead gen sites, insurance companies, lawyers, regular media, to even social media sites. Yeah, but that is only if I do something really bad so no worries… In most cases you could be right, but isn’t it better to make sure if someone is looking for blood that you show that you did everything by the book even though you might not have needed to or even better exceeded them & have the proof?